Your little hero will be ready to play around or save the day in a moment’s notice with the Batgirl Costume Dress from DC Comics. 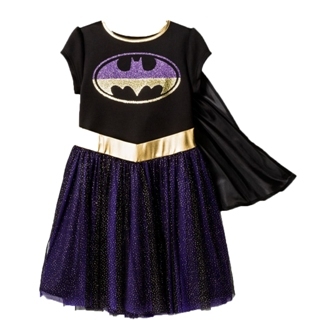 With the sparkly purple and gold Batman graphic and sparkly tutu-style purple skirt, this dress will keep her as strong and stylish as can be, no matter where she’s adventuring. Whether she wears it with the black cape or not, Gotham City is in good hands.